Lets play with some hardware. Lot of what I do at work is fix broken computers, since customers generally don't want the broken stuff (but we provide since it's technically theirs) I end up having lots of them. I also get lots of old junk like 4gig drives. 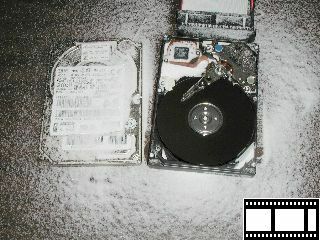 Once some of the other techs at work opened up a bigfoot harddrive and run it. 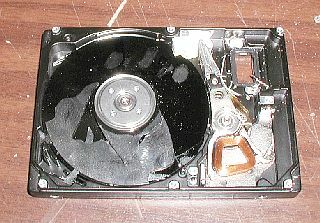 These drives have platters the size of cds and the drive itself is very slow. But if you look at the head moving while accessing data you would be suprised how fast it can move. 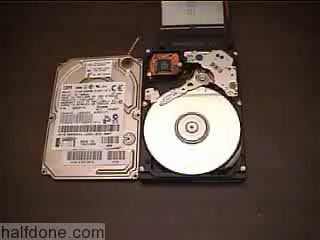 Atleast in this case it seems to be that the clunking is when the drive moves off the plater onto it's little holder, perhaps with lots of force. While it was cool to see what was happening when it failed, it gets boring quickly. Next I thought I would try testing the problem where even the smallest particle of dust (which would be unavoidible) got under the heads it would cause it crash into the platter and cause damage and scratch the disk. Since the drive was bad in the first place I can't really test this since it already fails diag tests but I can try to cause it anyway. Since I didn't have any dust I can use at the moment... ok I was too lazy to gather enough; I got out the salt. First I started to lightly sprinkle salt while idle. I had the video running and I was using my high backed chair as a shield incase it caused the plater to break off and spin off in my direction or something. Nothing happened. I then ran drive mechanical tests and sprinked some more without change. I next sprinked even more and got some results, it started to slam several times to the side, get stuck, unstick and still finish the test. Even completed more tests after that. Not to be beat by some wimply 4gig drive, I moved to pouring salt while running. Something that I didn't expect was that the harddrive would actually alarm on me. That is something I never seen before. I wasn't coming from the computer either. Now when I powered on the drive it would sound that alarm, spin up for a moment then stay off. After a few more tries it didn't even spin anymore. Also note how well the salt was distributed by the spinning disk. I tried to look for the speaker that is creating that alarm, I checked the controller board and even the heads without luck, connecting the controller board without the rest of the drive didn't cause it. No luck finding anything that looks like speaker or a buzzer. Since the alarm is quite loud I was thinking that it might be vibrating the platters so I attempted to remove them. I've done this before on full size desktop drive without problems but something I didn't expect was for the platter to shatter! It seems that these platters are made of plastic with a very hard metal coating. The metal coat didn't flake along the broken edges either (like on a cd) and I even tried to scratch it using a razor blade without luck. I don't see how just crashing the light head for a second would be enough to do any real damage to the disk. Not that I have a microscope or able to test magnetic damage. I might next try openning old drives and perhaps video tape it while installing Windows. Page last modified: June 20th, 2005 - 5:33pm Boston, USA time. 5,217,753 Hits on this page since July 20th, 2003. Page loaded in 0.004 seconds.